Send us your pictures and comments. We LOVE them! Nothing makes our day more than pictures of your beautiful furniture sets in their new homes. Thank you Linsay! I received my funiture set today. I love them. Thanks again. Our Top Selling Gable Dining Room Collection found a wonderful home in Louisiana. Lori did a great job with this one! This is Lori, Tim's wife. Thank you so much for all of your help!!! The furniture is beautiful!! John, these are the pictures of our furniture. We finally got it all put together, cleaned, and decorated for Christmas! These pictures don't do it justice!! It is absolutely beautiful!! I told Tim every time I look at, I think of King Henry the VIII. Lol!! Thank you so much for getting it here in time for Christmas!!! I can't wait to show it off!! Nadine's Imperial Antique White Wash Bedroom Set is Gorgeous! We are so glad she loves her new Bedroom Set! Stephanie's Turnbridge Dining Room Set with China Cabinet is the Perfect Fit! David loves his new Reuben Dining Room Set with China Cabinet! We think it looks very homey. When are we coming for dinner?! 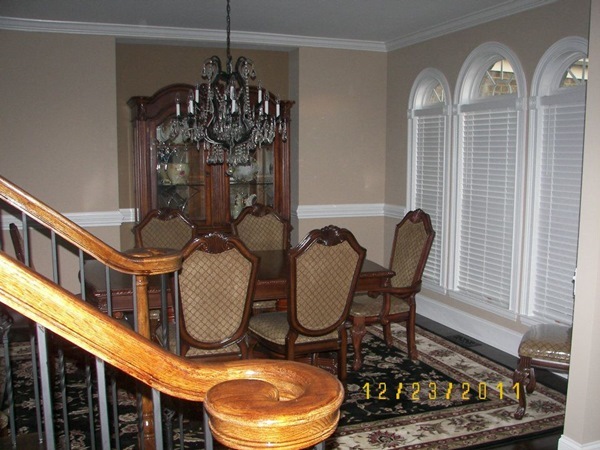 Jackie's Chateau de Ville Dining Room Set is picture perfect in her amazing new home! and is plenty big. Thank you for all your help and for meeting our expectations. mind for any future furniture needs. I just wanted to let you know my furniture came today and it is beautiful !! Thanks for caring, some vendors get your money and don't care about customer service. you for wonderful customer service!! happy with my purchase and a customer service. Thank you very much! I've come across as well as good quality furniture. in reality. It makes our whole downstairs look better. Thank you! Everything went great! Thank you again for getting the delivery team to bring the furniture into my condo. Although the delivery was not what we expected, the sectional is exactly what we were looking for. I sincerely apologize for the demanding phone call and want you to know I will recommend your site to all my friends, family, and clients. Hello! We got our delivery on Friday! I absolutely love my new bedroom set!! We inspected carefully & everything was packaged so well...there wasn't a scratch on it! Thank you for taking the time to pad each handle on the drawers & for emailing with concern as to the untimely delay & friendly reminder to inspect! We really appreciate it!! We are so incredibly happy! Love it!!! The furniture arrived right on time as scheduled. Thank you for my special delivery yesterday. I really like how my new Coaster bedroom furniture looks. Thanks to John and your son for the delivery and getting all pieces in one trip. The assembly is what brought it all together. Looking forward to future business. Just wanted to let you know that we received the bedroom set and we absolutely love it! Thanks so much again for your help and kindness. We plan to order again in the near future. I recieved my order in great condition just as expected. I want to extend my gratitude to Mrs. Lindsay for her exceptional service. Thank you all for your hard work with my order. I am very happy with my purchase. The package arrived this weekend. I appreciate the prompt replacement for the ottoman foot. I've never purchased furniture online before but I did so at my mother's encouragement. I'm sure glad I did. It has been a wonderful experience buying from you. Not only is the furniture beautiful and comfortable, but also your customer service is top-notch. You followed up with each and every inquiry without delay. If I need furniture again, I'll be sure to look on your website. THANK YOU Lindsey, I have really appreciated all of your GREAT customer service through the entire experience with Von Furniture. Just took delivery on your #XUNIT-LK3 CH Top Grain Leather with Cowhide Rustic Sofa Set Made in Texas from Von Furniture. INCREDIBLE! PERFECT! I am so pleased with quality and appearance. Furnishing a 4200sqft cabin in Colorado. I'll be back! We love love love our new leather sofa set!!! It was really scary to buy furniture without seeing it first or sitting on it, but the experience was amazing, your delivery guys were great, and the furniture is even better in person. Thank you!! !